(James Stewart Martin) The story of German industry before World War II should sound increasingly familiar to Americans. Industries are being consolidated and a few wealthy men are holding the reins. That alone makes the book excerpted below — All Honorable Men: The Story of the Men on Both Sides of the Atlantic Who Successfully Thwarted Plans to Dismantle the Nazi Cartel System— an important read. However, the book offers much more. The publishers describe it as “A scathing attack on Wall Street’s illegal ties to Nazi Germany before WWII — and the postwar whitewashing of Nazi business leaders by the US government.” This is no exaggeration. In fact, the CIA allegedly tried to buy all copies of this book when it was first published. The author, James Stewart Martin, had been the Department of Justice’s Chief of the Economic Warfare Section during World War II. Part of his job had been suggesting key German industries for aerial bombardment. After the war, he became director of the Division for Investigation of Cartels and External Assets in American Military Government. 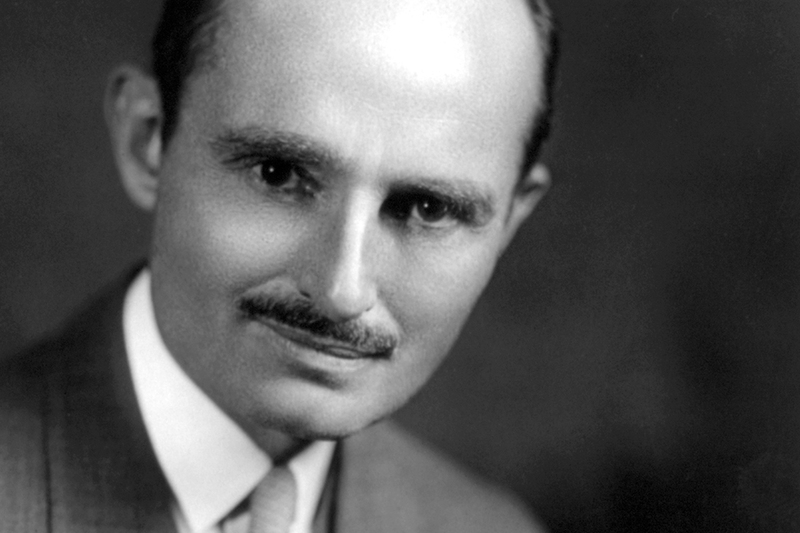 President Harry S. Truman sent him to Germany to investigate Nazi economic warfare, and to dismantle Third Reich industry, that is, to transition the monopoly control of German businesses to a free market economy, a process known as decartelization. Martin was also sent to Germany to investigate the connections between these Nazi-controlled cartels — and Wall Street. 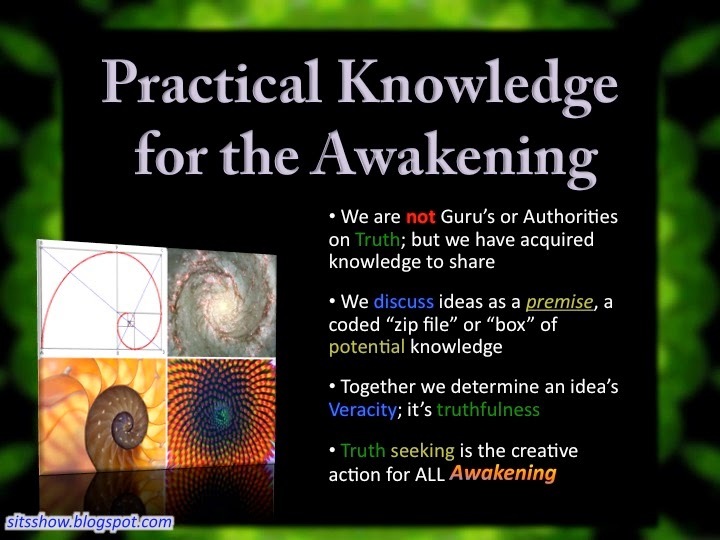 The connections were wide and deep. 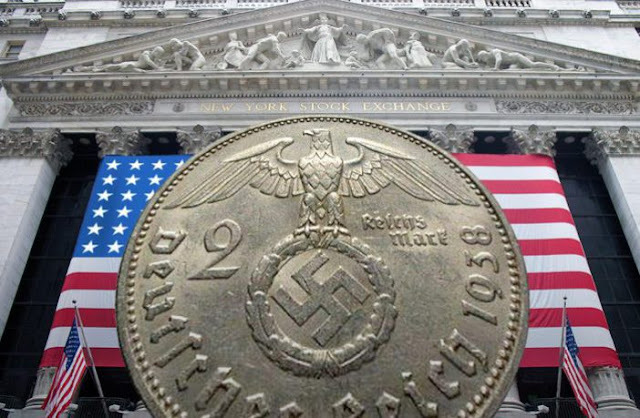 Many US corporations had done business with German corporations who helped fund the Nazi Party. And these businesses on both sides of the Atlantic knew what their money was supporting. Chapter 1 from All Honorable Men: The Story of the Men on Both Sides of the Atlantic Who Successfully Thwarted Plans to Dismantle the Nazi Cartel System, by James Stewart Martin (Kindle Version, Forbidden Bookshelf 2016), (First published by Little, Brown and Company, 1950). The day I started to write this we discovered termites in the basement. We were preparing to build a wing on our old house and found a colony of them in the heavy timbers. Termites are able organizers, and thoroughly attached to their way of life. The area they occupy is small in relation to the house — just the heavy underpinnings. They object vigorously to outside interference from the people who live in the other parts of the house. They object especially to structural changes, which they are bound to consider unwarranted. They have two good reasons for objecting to changes. In the first place exposure to light and air kills them. In the second place any movement of the underpinnings ruins the whole structure of tunnels and channels which their enterprise has built within the framework of the house. We hated to disturb them. They looked busy and enterprising. They seemed to want nothing more than a comfortable existence in accordance with their way of life. We cleared the termites out to save the house, but I think I know how they looked at the whole matter. At the end of the Second World War I spent two and a half years in Germany dealing with some people who must think pretty much the same way. Throughout this period there were occasional rumblings in the press from Thurman Arnold [FDR’s attorney general, DOJ antitrust division], who was complaining about the international affairs of some American corporations. These companies were often mentioned in connection with the German dyestuffs and chemical trust formed about twelve years earlier, known as the I.G. Farbenindustrie…..
Later on, during the war, the subject of private international arrangements among business firms, especially when they took the form of cartel agreements, got a considerable amount of public attention. But in those earlier days it was different. Many people could see no important principle at stake when the government announced some new antitrust suit against a group of American and foreign firms. On the surface these international cases appeared to be no different from any other government lawsuit such as one involving a monopoly of Wisconsin cheese or California hardwood. At first the only remarkable feature of the operations encountered in the international cases was their size and scope. Even judging from the brief summaries in dispatches from Washington something in the giant stature of the companies involved, some hint of the vast sweep of their arrangements, reminded one of an ancient Greek epic. I began to piece together a story from a growing collection of newspaper clippings. The cases Arnold and his men were talking about had to do with a series of arrangements dating back for a decade or so, to 1926 and 1929, when international agreements among some of the biggest American, British and German firms had quietly divided up the world. What I heard and read of these antitrust cases and the new sort of international brotherhood they implied — a business brotherhood more solidly built than the “international finance” of past generations — began to bring other events closer to home. In mid-March 1939, when a group of some of the largest British and German industrialists gathered at Düsseldorf to map plans for the economic collaboration between their two countries, the press barely reported the meetings. I might have skipped the news items entirely had I not been already familiar with the subject matter. It was impossible to overlook the fact that the industrialists who were meeting at Düsseldorf were from the same groups of companies which ten years earlier had arranged the three-way split of the world’s markets. The growing conviction that these private international arrangements were important was brought to a head by my encounter with the German ex-chancellor, Heinrich Brüning, early in 1940, during the period of the “phony war.” St. John’s College invited Dr. Brüning to give a lecture about the last days of the German Republic and how he had been deposed to make way for Hitler. His lecture was largely a description, by hindsight, of his own blindness during the time he was chancellor. Dr. Brüning’s story was one of being always a step behind the events. By his own account he never knew what hit him until after he had been deposed and was hiding out in the mountains of Austria. While gangs of Nazis combed the countryside looking for him, he spent his days reading and for the first time understanding Thucydides’s classic history of the Peloponnesian War: a work that generations of British diplomats have used for a teething ring, and that Dr. Brüning had carried with him from his early youth. As he reread Thucydides’s story of ancient power struggles, he suddenly began to realize what forces had been combined against him in Germany: how under the pressure of administration he had assented to decrees that weakened the “equal protection of the laws,” and how large-scale economic forces had made inevitable some developments he had tried to stem by “voluntary” agreements among business interests. Even in the retelling, however, it seemed to me that Dr. Brüning again showed some of his former blindness. The main point in Thucydides’s history was the discovery of the large part that economic forces play in bringing nations into conflict. 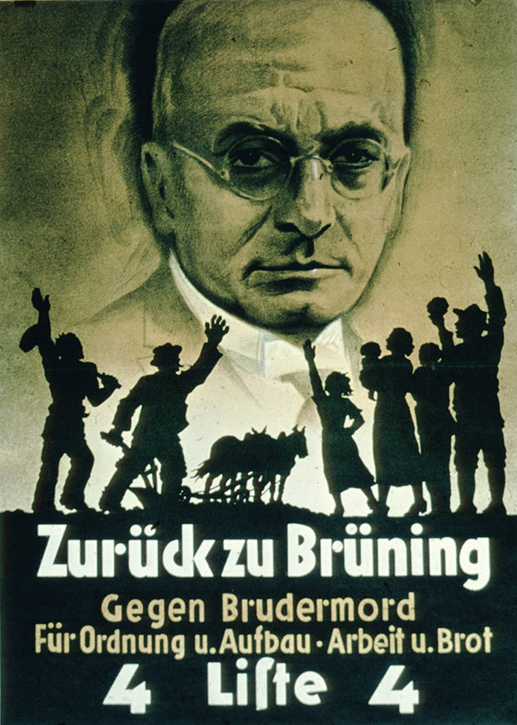 Election poster for the German Center Party in the final phase of the republic. Heinrich Brüning was the last Reichskanzler, whose cabinet had a certain parliamentary basis. Yet, even when pressed by questions, Dr. Brüning showed no particular concern over the role of the large German industrial corporations. He related the entire story of Franz von Papen’s intrigues, his posting of gunmen to prevent Brüning from seeing the aging von Hindenburg, and the other events of the last days, without once alluding to von Papen’s conferences with the bankers and the Rhineland industrialists who agreed to back Hitler and who put up the funds. It was, throughout, a story of politics without economics: a story of a man who had felt that no harm could come from temporary dictatorship so long as the laws and the courts protected civil rights, who showed no feeling for the ways in which great economic power and unlimited funds could get around an inconvenient legalism. In Dr. Brüning’s view it was the refusal of groups like the German winegrowers to improve their export markets that had curtailed Germany’s export trade and intensified the depression. His talk would be comparable to an American’s blaming an economic depression in the United States on the activities of the Farm Bureau Federation, with scarcely a word about our industrial firms, or the level of industrial employment. This was quite puzzling, in view of all that had happened in the preceding seven years. I knew that before he was ousted, Dr. Brüning’s political enemies had called him the “I.G. Chancellor” — a suggestion that the gentlemen of I.G. Farbenindustrie had got pretty much what they wanted under his administration. Yet the man himself was far from presenting the appearance of a person likely to be influenced by or to have much influence with “big business.” He looked a great deal like Woodrow Wilson. He had risen to the chancellorship from the post of Minister of Education, not from the board of the Deutsche Bank. Even his manner was Wilsonian: a combination of professorial bewilderment and amazed indignation at the way the world goes. This man who had been at the top in Germany when Hitler’s Nazi program was put across had seen too little at the time to plan any counterstrikes. Later, sitting in a mountain hideout and reading an intelligent account of an ancient Greek war, he had felt the stirrings of an awareness. Things unknown to him at the time, things he had not even heard about, had been moving under his feet. In the end they had dethroned him and plunged his country and the world into a major catastrophe. Yet still later, in looking back on the events, he seemed to be missing the point. I thought at the time that I might be just seeing ghosts. It was too easy to draw parallels between what had happened economically in Germany and what could be happening in the United States. Thurman Arnold seemed to be saying, sometimes patiently, but more often with an emphasis reminiscent of Donald Duck, that great forces were at work through the channels of what we in the United States had regarded as ordinary business. Arnold was charging that some of the transactions of ordinary business had crippled productive power in the United States, regardless of the motives that prompted the individual deals. If Arnold was right, there was something of serious general concern in the private arrangements made in the twenties and thirties among American, British, and German industrialists. Yet Arnold’s boss, Attorney General Francis Biddle, did not appear to be impressed by the noise Arnold was making. By 1941 it seemed even that Biddle had become resentful of Arnold’s constant baying. A newspaper column by Thomas L. Stokes hinted that Arnold and Biddle had clashed over the investigation of international agreements between Sterling Products, Inc., a drug firm, and Germany’s I.G. Farben. Stokes said that Thomas G. Corcoran, late of the Roosevelt brain trust, acting as attorney for the Sterling company headed by Corcoran’s brother, had prevailed upon the Attorney General to quash an antitrust prosecution and to accept a “consent decree” instead. This legal move took government investigators out of the files of the Sterling firm and closed the curtain on the details of what had been going on between Sterling and Farben, in return for the Sterling company’s promise to clean house and behave in the future. The newspaper stories of the Sterling case were fragmentary. They stated only that a business arrangement between the two companies had allowed the German firm to keep a tight grip on its overseas markets in Latin America during the war in spite of a tight British naval blockade. By arrangement between Germany’s Farben trust and the Sterling firm, drugs manufactured in the United States had been shipped in bulk to Farben agencies in Latin America. These German agencies labeled the drugs “made in Germany” and kept right on supplying their customers while they laughed at the British blockade. The idea of economic warfare seemed simple enough. Germany and Japan were enemy nations. To produce war materials and to keep their people alive they had to get some kinds of goods from territory outside the areas their armies controlled. To keep them from getting these items, the nations on our side could resort in the first instance to naval blockade. Beyond blockades there were the possibilities of buying up scarce commodities to keep them out of enemy hands, or of persuading non belligerents not to sell to the enemy. 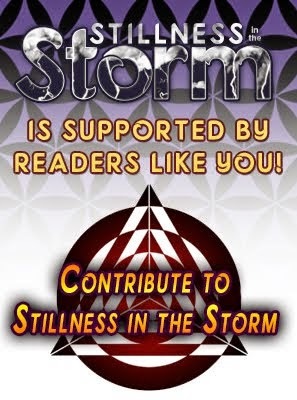 These activities would, of course, connect up with the Air Force’s “strategic bombing” of important production facilities in enemy territory — the attempt to undermine enemy war production by knocking out key factories. One night in February 1942 I had a phone call from Edward H. Levi, one of the members of Thurman Arnold’s staff. He asked me to leave my post at St. John’s College and take a position as special assistant to the Attorney General. I was to help organize a unit in the Department of Justice to work with the newly created Board of Economic Warfare. Soon after the Board was set up, Milo Perkins, its executive director, had written to the Attorney General asking for reports on the international business ties between American firms and firms in enemy territory, wherever these ties could be expected to work to the advantage of the enemy. Also Mr. Perkins had asked for any information that would give details of industrial plants and industrial production in Germany and Japan. Such information would be useful to the Air Force as well as the Board of Economic Warfare. A short time later, in conversations with Johnston Avery, administrative assistant to Thurman Arnold, I found out more of the details and agreed to join the team. I worked with members of the Antitrust Division in setting up in the Department of Justice the Economic Warfare Section, of which I finally became chief. We set up field offices in principal cities, the largest part of the staff being maintained at New York, where Robert Wohlforth headed some twenty or thirty lawyers and investigators. Our object was to test the possibilities of viewing the enemy through the chinks and loopholes of international business arrangements. Once we knew which American companies had agreements with which Japanese or German companies we knew where to find engineers and technicians who had visited, and in some cases even had drawn the blueprints for, plants making synthetic rubber, synthetic gasoline, tetraethyl lead, precision ball bearings, and the like. This kind of reporting became known as “bombing” work and we found ourselves quickly dubbed the “bottleneck boys.” Air Intelligence wanted to find out as much as possible about the industry in all areas where the Air Forces might be operating. They wanted to know the relative importance of different plants, partly to help plan the targets for bombing missions, and partly to help in figuring out what they had hit after the raid was over. We had neither the staff nor the facilities to make sweeping economic studies of German industries. But we could find out, from men who ought to know, which plants producing what materials were likely to be the “bottlenecks” in German production. 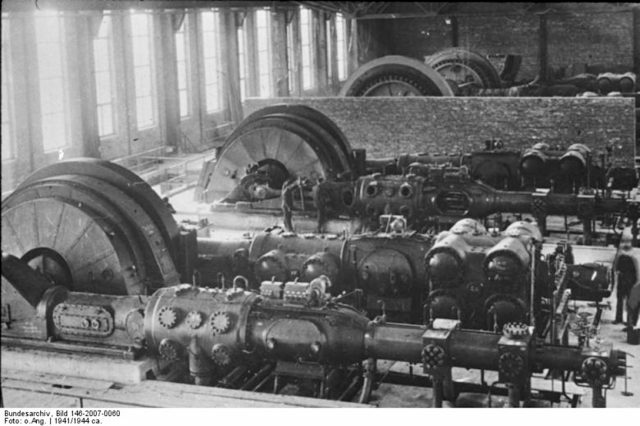 We had no way of knowing where all the coal mines or steel plants in Germany were; but we did find out that, by agreement among the biggest producers of precision antifriction bearings, practically all such bearings of any importance in Germany were made in only three factories grouped around the railway yards in Schweinfurt. We could not locate all the gasoline refineries; but we did find out that there were only three plants equipped to make the tetraethyl lead which is necessary for high-octane aviation gasoline, and we found a man who could draw pictures of all three. We did not know where to locate all of the mills producing brass for cartridge cases; but one of our men did find out that there were only two ways of making the special high-grade zinc that goes into this type of brass, both ways being the subject of patents, and he found blueprints and diagrams of all plants in Germany capable of making this zinc by consulting the files of two American companies. While other agencies hired economists and technicians to lay out large studies of the German industrial economy, our men interviewed men from Du Pont, Standard Oil, International Telephone and Telegraph, Anaconda Copper, General Motors, General Electric, and investment bankers and other businessmen who had been to Germany on what turned out to be “bottleneck” deals. As we worked on the search for bottlenecks in German production, we began to find a close relation between international business agreements for the restriction of production and the kinds of products which were especially critical in wartime. The trouble was that these international arrangements which pointed up the importance of certain commodities in the German economy had also resulted in restriction of production in the United States. Arnold’s men found that one company, Rohm & Haas of Philadelphia, was not able itself to produce enough transparent plastic sheets for bomber noses. But because Rohm & Haas of Philadelphia had Du Pont under a special agreement, as part of a more complex and wider four-way arrangement involving Du Pont and two German firms, I.G. Farbenindustrie and Rohm & Haas of Darmstadt, Dupont was permitted to turn out only a limited quantity of the plastic sheets. While government expediters were tearing their hair over slow deliveries, Du Pont was writing to Rohm & Haas of Philadelphia that they would have to tell the government about the agreement unless Rohm & Haas would lift the restriction. We discovered even more spectacular complications, such as those in the three-way arrangement among the aircraft-equipment firms, Bendix of the United States, Siemens of Germany, and Zenith in England. The Ministry suggested they would prefer to manufacture the carburetors themselves and asked us to waive all our rights in this matter. These business arrangements operated at focal points where it was possible to turn on and off the main valves in economic pipelines. It was not long before we found that the arrangement of valves and pipelines was a two-way affair. Our elation at the discovery that practically all of Germany’s fine optical glass came from one factory, the Schott Works at Jena, was counteracted by the discovery that under the same working arrangement only one such factory of any importance existed in the United States. The pin point for bombing in Germany could be the blueprint for sabotage in the United States. As if to add point to such thoughts about sabotage, during the summer of 1942 the Justice building in Washington played host to the trial of eight Nazi saboteurs who had been landed by submarine to blow up some of the key factories in the United States. Morning and evening the black vans of the United States Marshal trundled the prisoners under our windows and all day long the drawn blinds on a row of windows two stories up and across the courtyard were a reminder that sabotage in the literal sense of the term was not just a theoretical possibility. But sabotage in its literal sense was not the point. As our piecemeal reports stacked up a picture began to emerge of an enemy that did not need the services of trained, professional spies and saboteurs. 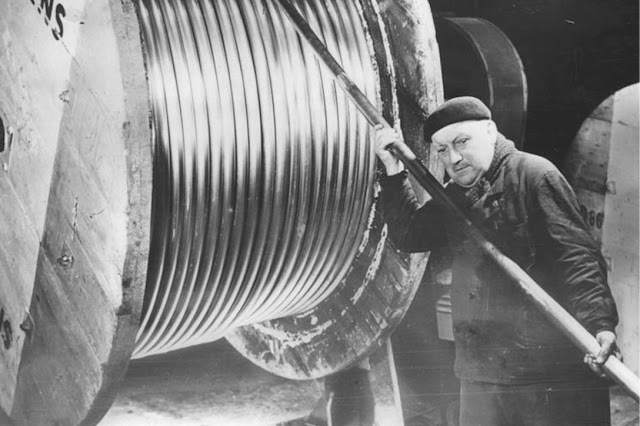 By agreement between German and American producers of magnesium — needed for aircraft — production in the United States before the war was limited to no more than 5000 tons per year. In contrast, Germany in 1939 alone used 13,500 tons and during the next five years consumed magnesium at the rate of 33,000 tons per year. Here was a case where American “business-is-business” men had, knowingly or unknowingly, helped a German firm to close some valves over here, with far more effect than the eight saboteurs could ever have achieved even if they had been allowed to do their utmost. Plants which have never been built are more dead than plants which have been bombed. A bombed plant may still live in its blueprints and in the trained labor force that had been operating it. As the evidence piled up to show German success in negotiating restrictive arrangements, the contrast between the limited possibilities of cloak-and-dagger sabotage and the greater possibilities of safely negotiated business arrangements became more and more heavily underlined with each passing of the Black Marias under our windows. Unfortunately, Francis Biddle and Thurman Arnold were still like stiff-legged fighting roosters with each other. Some of Biddle’s public remarks, including humorous references to the “bombing” work of Arnold and his boys, seemed to confirm our impression that the Attorney General considered what we were doing to be the product of a somewhat amusing mental aberration. Finally, combined pressure from the War and Navy Departments and the War Production Board prevailed in suspending the enforcement of the antitrust laws for the duration of the war in all cases affecting industries considered important to the war effort. 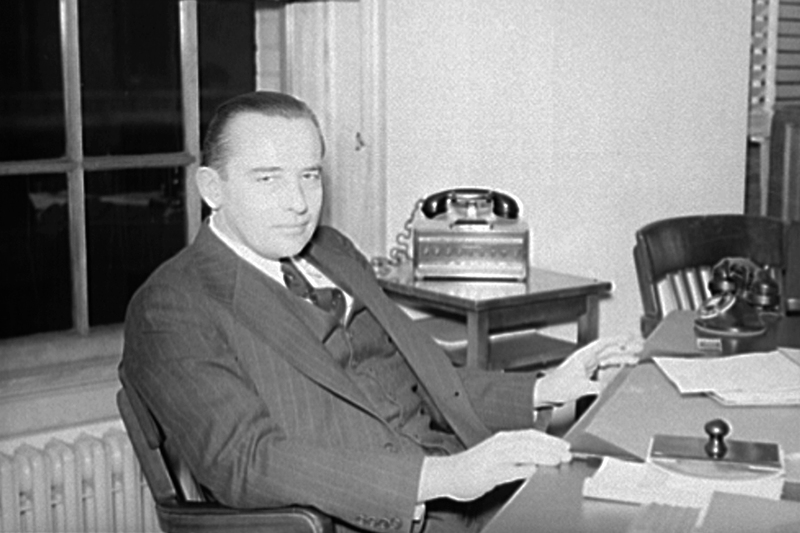 All that was necessary to stop an investigation or the prosecution of a case was a certification from Robert P. Patterson, Undersecretary of War, James V. Forrestal, Undersecretary of the Navy, and John Lord O’Brian, General Counsel of the War Production Board, that any attempt to press the case would interfere with the war effort. This signaled the end of Thurman Arnold’s great trust-busting drive. A short time later Arnold allowed himself to be kicked upstairs. He accepted an appointment as judge of the Court of Appeals for the District of Columbia. With Arnold’s departure the Attorney General showed signs of more serious interest in the evidence of how the German program of economic warfare had been carried out. Biddle called for more and more thumbnail sketches of what we were discovering. By the spring of 1944 the time came to add up the score. In three years, with a staff of less than sixty people, we had prepared thirty-six hundred of these snapshots of German economic power in action; but the Attorney General wanted to know the conclusions of all these findings. We began to summarize our picture of an enemy that could survive a military defeat because it did not need or use military weapons. … The history of the use of the I.G. Farben trust by the Nazis reads like a detective story. Defeat of the Nazi armies will have to be followed by the eradication of these weapons of economic warfare. We had started out to get a picture of our military enemy and had found a much bigger enemy, of a quite different sort from the popular picture of hobnailed Nazis with guns and tanks. Late in the summer of 1944 Francis Biddle, the man who three years before had found nothing very important in the Sterling Products case, and who two years before had been amused by Thurman Arnold’s “bombardment” of Germany, told a Senate committee what he thought must be done during the occupation of Germany. These firms in reality operated as departments of the German Government. They evaded and violated the peace treaties in order to build up Germany’s military strength. It was the theory of the German Government that operating under the guise of ordinary commercial arrangements, these firms could be used to weaken Europe and America so that when the military war was resumed, we would lose. Through the techniques of industrial penetration, they hoped to be able to cripple American production, to gain from us technical know-how, to conduct espionage upon us, and to establish centers of propaganda throughout the world. I hope, as the years go by, we will not forget … not because I wish to have individual American companies condemned, but because these things should not be permitted to happen again. It is the system under which Germany was able to make these cartel agreements that must be broken up. At the present time it is probably inaccurate to speak of separate combines or cartels in the German economy. They are all linked together—the munition makers, the potash industry, the machine trust, the oil industry, the electrical manufacturers, the steel trust, and the chemical companies. They exist as part of the Nazi government. We may expect, however, that when the government falls they will appear again as separate combines. The companies which were used as instruments to violate the peace treaties, to dominate industry in Europe, to support the Nazi war machine, and to restrict production here will then appear in the guise of ordinary commercial firms.